I've been meaning to post this for a while now. Best of the two ~ Coralista OR Sugarbomb? I was holding Sugarbomb in my hand at a Benefit counter in KL, and I remember thinking to myself: "Umm...so this is Sugarbomb. Hah." The compulsive shopper in me was like, "Oh, would you stop that and just take it home! =["
I told the very helpful SA there that I already have Coralista and would just like to see if they're similar. SA immediately said they are very similar, so no point in me getting Sugarbomb too. Now that's a good SA! Coralista looked better. The coral in it just came out more beautifully, whereas Sugarbomb looked a tad too glowy/shimmery and somehow the coral didn't show up like I wanted it to. I'm not saying I don't like Sugarbomb. I'd probably love it if there wasn't a Coralista, but not in this lifetime. I think Coralista is better so much that, even if I had finished it or hit pan, I'd still pick it over Sugarbomb. Nuff said. 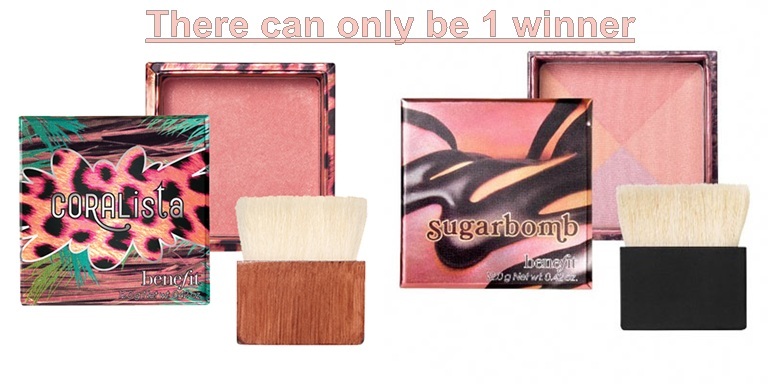 haha I like this :) I have sugarbomb and not coralista. I didn't get coralista because I already have a billion coral blushes. I enjoy having sugarbomb, but its not an absolute must have. I may get coralista soon, whenever my bank account (of my own money, not given by the rents) allows. I believe you and would consider Coralista the best!! Interesting comparision here, as of now I dont own any Benefit blushes but now I am tempted to try the Coralista as I love peachy colors!